YAY - I'm pregnant too!! Due in early November I have just recovered from 3 months of morning sickness - or should I say all day/night sickness!! I couldn't even look at a computer screen nor eat/drink anything. I actually lost weight the first trimester. With my first child I didn't feel a thing so this was a bit of a shock and very unexpected. But finally it's over and I'm feeling normal again and am right back into business!! I have been living in my 1 in the Oven essential pants and 2 chix long sleeve tees! At just 3.5 months I do have a small belly and while I was feeling sick I wanted soft comfortable pants that didn't put alot of pressure on my belly. These classic pants are divine - and the cut and fit is just beautiful - plenty of room for my growing belly! I have also been wearing my 1 in the Oven maternity henley as I'm still breastfeeding my 2 year old son. The buttons down the front allow for easy access to nurse. In cooler weather I wear a 2 chix tank underneath it - I LOVE layering!! Off to a new baby product launch tonight so gotta run! 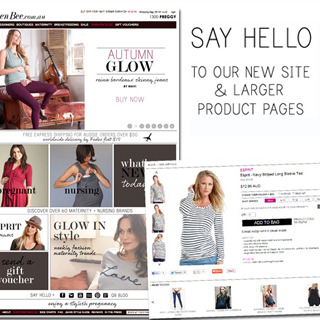 We're very excited to finally launch our new look website and larger product pages to make online shopping at Queen Bee easier than ever. Discover over 60 maternity and nursing brands at your fingertips and be the most stylish pregnant mummy in town!